A record-breaking 113,000 visitors from 142 countries attended this year’s Musikmesse and Prolight+Sound expos in Frankfurt. This statistic spelled success not only for the show but also for Christie, who returned to Hall 9 as exhibitors in their own right after a break last year. Pride of place went to the Nitro moving yoke series. The company welcomed existing and new customers to hourly presentations given by Christie field application engineer, Jan Walter, in which he compared a Christie YK100 single arm projection yoke (specifically designed for Christie M Series and Christie LX1500 projectors) to a standard moving light. Like for like differences were compared, such as Focus, Strobe and Gobos — and the large crowds responded favourably to the Christie offering. The YK100 is one of the three models that form Christie’s Nitro Solutions series of integrated yoke and digital projector systems, which enable bright, high-quality video and lighting effects to be projected onto virtually any surface. Alongside is the YK50, a small, dual-arm yoke designed to be used with either a Christie LX700 or LHD700 projector, and at the top of the range is the dual-arm YK200, for projectors between 12,000 and 20,000 ANSI lumens. These are purpose designed to support the Christie 3-chip DLP Roadster J series. A further eye-catcher was Christie’s 10m wide projection mapping demonstration, using five Roadster HD20K-J. With the growing popularity of 3D mapping, this attracted much attention and demonstrated the value of this high brightness projector, with its integrated Twist feature, in a mapping context. In addition to the YK100 presentation, several YK50’s were then deployed to ‘spread’ the look and feel of the projection mapping onto other areas of the stand, such as screen, floor and ceiling. 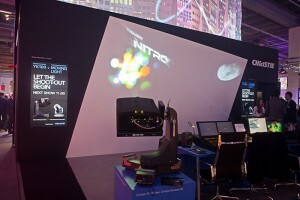 Also featured was a MicroTiles display, which outlined the Christie products being used during the presentation, plus an additional 2 x 3 MicroTiles display, using the Christie Interactivity Kit, which allows multiple users to interact simultaneously with content on this, and any large-format video wall.